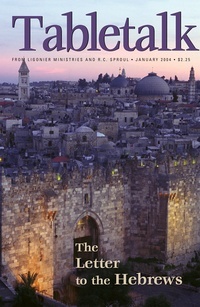 The January 2004 issue of Tabletalk examines the letter of Hebrews in preparation for the 2004 daily studies. Contributors include R.C. Sproul along with John de Witt, George Grant, Paul Hahn, Keith Mathison, Richard Phillips, and R.C. Sproul Jr. Tabletalk features articles about topics central to the Christian faith and daily, in-depth Bible studies.